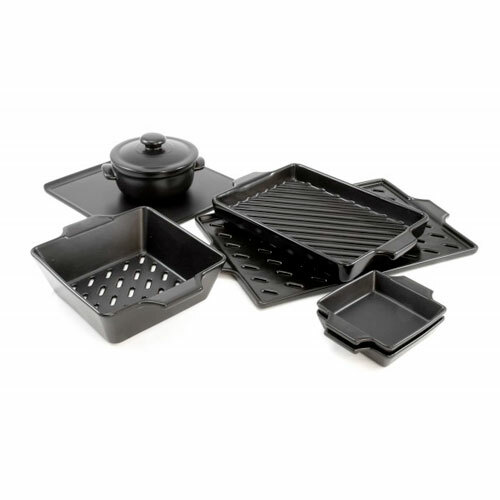 Flame-Friendly® Ceramic Grillware | Patio and Hearth Co.
Get the benefits of cooking with high heat without the weight or maintenance of cast iron! The Flame-Friendly® series of grilling accessories conduct high, evenly distributed heat to cook your food but are lightweight and easy to clean. Eco-friendly, fireproof and thermal shock resistant up to 700˚F., they are a perfect choice for both the oven and the grill. The attractive non-stick glazed finish is also scratch resistant, so your grill grid will look good through many cookouts. Series is not recommended for a sear burner. Inquire about Flame-Friendly® Ceramic Grillware using the form below.